For many students, the reading and writing section of the SAT proves to be most difficult, and for good reason. 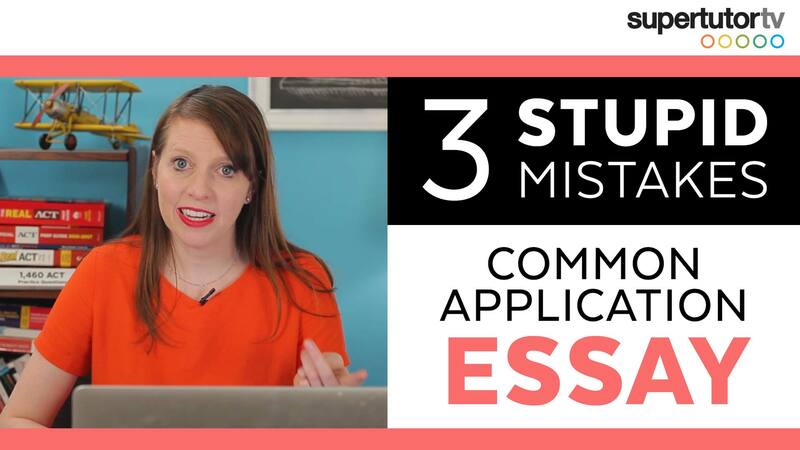 However, by taking just a few minutes to brush up on a common mistake students make when analyzing passages and answering questions, you could raise your score significantly. Here is the most common mistake made on the SAT reading section, and some tricks, tips, and strategies for a perfect score! Many questions on the SAT require you to look back at the passage and analyze a sentence, phrase, or word, often asking how it relates to the passage in a larger sense. The largest mistake students make when working with these questions is failing to get enough context. This means only reading just the sentence it is contained or even just the few words around the phrase. If a question asks about a phrase, it is not enough to just go back and read the sentence that contains the phrase. Students should read one, two, or even three sentences before and after the phrase in question to ensure that you know what is going on in that particular point of the passage, and how it relates to larger ideas. In some special cases you may have to do even more contextual reading—the point is that you must establish context until you completely understand the passage in question. This is what is required to answer these questions with confidence. Now, let’s look at some examples. These questions were taken from practice test 5, which is from May of 2016. This question is on a passage from Catharine Beecher, Essay on Slavery and Abolitionism (1837). After reading the two passages, a student may look at question 15 (above), simply read the word “peculiar” and the three words behind it on the same line, and decide that “peculiar” is just a synonym for “different,” which appears just before, and then conclude the answer is “A) eccentric”. This approach is extremely limited in scope and very unlikely to consistently yield correct answers. However, a better approach would be to begin reading a few lines above line 12, or if time permits, all the way at the beginning of the passage. Doing this, we learn that, while women hold a lesser position in this society, it is not because their duties are any less important than those of men, but rather that their very functions are separate and distinct. It is from this understanding that we can safely arrive at the correct answer, “C) distinctive.” Notice that, under this understanding, “A) eccentric” is no longer a viable answer. Let’s look at another example. 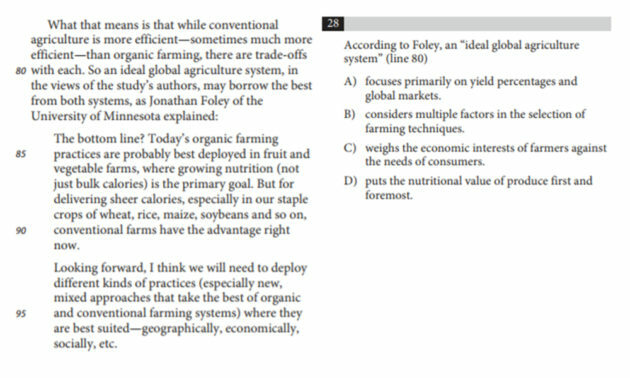 This question is on a passage from Bryan Walsh, “Whole Food Blues: Why Organic Agriculture May Not Be So Sustainable” (2012). After reading the passage, a student may look at question 28 (above) and only read the sentence in which the phrase “ideal global agriculture system” is contained. This sentence refers to a system which “may borrow the best from both systems…” At this point we have little information with which to answer the question, as we don’t know what “systems” even refers to. Unfortunately, students may make the mistake of seeing the phrase “best of both systems” and matching it with “considering multiple factors” in answer choice “B”. This lack of context has once again caused the selection of an incorrect answer. Instead we should read the surrounding text to establish context. In the paragraph following the quoted line, the passage discusses how the “ideal global agriculture system” seeks to strike a balance between the efficiency of conventional farming (volume and profit for the producers) and the health benefits of organic farming (nutrition for the consumers). This means that we are looking for a balance between the success of the farmers and the health of the consumers. After eliminating answer choice “A” for being inconsistent with information in the passage, and answer choice E for being too strong and also inconsistent, we find that choice “C” aligns clearly with the larger ideas of the passage. 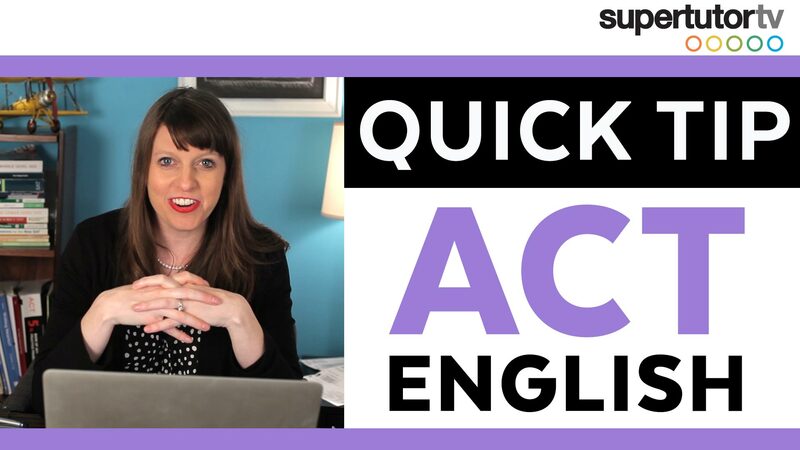 Looking to improve your ACT English test score with awesome tips, tricks, and strategies!? Here's a sneak peek from our ACT full online video prep system we're working on!